You guys love the gift guides! I got such a good response from my tween gift guide last week! 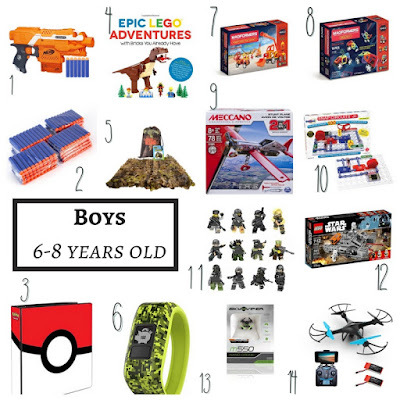 So, today just in time for cyber Monday, I have a boys gift guide ages 6-8! I think this age in boys is hard, only because in my experience, they want everything! Everything he sees, he needs, he can't live without and I feel like I have been saying, "put it on your Christmas list" constantly for months! The list is long, so how do we choose??!! Here are some ideas of items that were hits last year, made this list this year or sound like fun! 1. Nerf Guns - I don't know about any of the boys in your life, but my son is obsessed with Nerf guns. Even if he doesn't have bullets he loves playing with his friends and running around playing games with these. This particular gun, the Nerf Stryfe is on his list this year. 2. Nerf bullets - these are always needed! They are always lost outside and now our puppy is chewing on them constantly. I find Amazon has the best deals on bulk bullets! They are not Nerf brand, but they are compatible and we have had no issues! 3. Pokemon binder - We have a lover of Pokemon cards in this house. Although I don't even think he really knows how to play the game, he loves to collect the cards, go through them, and play his own version of the game. Since he has started collecting them he has collected a whole bunch so now we need a good way to store them! This binder was on his list, don't forget the 9 pocket inserts to go in it! 4. Epic Lego Adventures - we have so many Legos in this house! I am not complaining, because he can lose himself in Lego creativity forever sometimes. But the actual sets we purchase only get made once, so their are tons of Legos. I thought a book like this would be a perfect way to be creative with the Legos we already own, rather than buying a whole bunch of new Lego sets! 5. Nature Bound Camo Netting Kids Fort - this looks like a lot of fun to build a fort with in the backyard! Especially when they are playing their Nerf war games. Also fun to bring to the woods and spend some time out there! I think this will be a hit even if it only gets used inside until spring, we will be making igloos by Christmas I am sure! 6. Garmin Vivofit Jr. - I saw this come up and I feel like this would be a huge hit in our house. Mike has something that he tracks steps on, and my little man wore his old tracker that no longer worked all the time just because dad had one. I think he would love to use one that actually works and what a great way to continue to stay active in the winter, which can be difficult in the snow and cold. Plus it benefits me by assigning chores and keeping track of allowance! Win win! I think we would get the Digi Camo color because it looks like Minecraft to me! 7/8. Magformers - Owen received a few sets of Magformers for Christmas last year and they still get pulled out and played with. Usually he is building and using the wheels from the #8 set so I was debating the #7 set because I feel like that would still interest him! Last year he also go a package with just a whole bunch of the magnets so he had more to be creative with, such as this set. 9. Meccano - I saw these pop up and think if your child likes to build things, they seems super cool! I love that they come with real tools. I think my little guy would love this! There seems to be a pretty good variety for each age range. I was thinking of trying just one small pack to see what he thinks! This stunt plane is only $10 for ages 8+! If he does like it there are so many more to choose from going forward and for that price, what a great gift to bring to a birthday party too! 10. Snap Circuits - these are another thing I have seen around and I think this would be a great gift to keep him busy and interest him! Isn't that the goal? There are tons of different kits, different ages and different price ranges, so I went with this starter set to see how he likes it! 11. SWAT team mini figures - these were seen at a friends house and immediately went on the list! These are perfect stocking stuffers because each guy comes packaged individually! Mini figures are a favorite in our house! 12. Star Wars Lego Kits - I can literally not get through a Christmas where there is not a request for Star Wars Legos! This kit made the list this year! 13. Sky Viper Nano Drone - there was a drone obsession in our house last year! This was the nano that he got for his birthday and he loves it! I love it because it isn't as big as the other drone he has for using in the house! It was the perfect size to bring for show and tell at school too! 14. Drone with camera - this was at the top of the list last year and it was under the tree Christmas morning! It was flown in the garage until he had a handle on the controller and now he can fly it outside. A year later and he still loves this! Totally worth it! I hope you get some ideas for Christmas from this list. I am still making decisions on a few things! I love trying to find some new interesting toys that are unexpected because honestly even though the list is long, you can only have so many Nerf guns, Pokemon cards and Star Wars Lego sets, am I right? ?